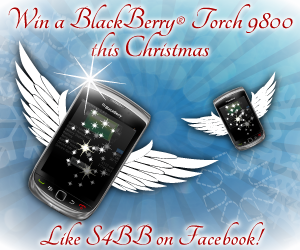 Are you already in the race for the BlackBerry® Torch 9800? We hope so! If not hurry up and sign up NOW! The deadline is next Saturday the 24th at midnight (PST). Enter now! Previous Previous post: Barcode Scanner – Read QR-Codes with your BlackBerry Smartphone! Next Next post: Battery Booster for all Android Phones – Extend your battery run time significantly!